The Liberal Arts program provides the first two years of a traditional liberal arts curriculum. 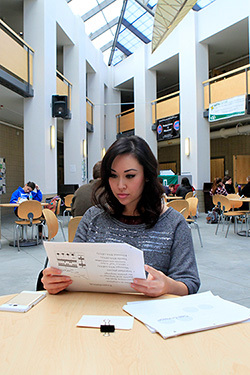 Most CCRI students who enroll in this program plan to transfer to a four-year college or university in pursuit of a bachelor’s degree. The Liberal Arts program offers students the opportunity to acquire a perspective on world cultures and language while developing essential skills in critical reading, organization, effective writing, analysis and research. Students who successfully complete this program and/or a Liberal Arts concentration receive an Associate in Arts (A.A.) degree. Students may concentrate in English, foreign languages, or liberal arts. All Liberal Arts students must complete six sequential credits of foreign language under the general education requirements. Liberal Arts students who wish to pursue a Liberal Arts degree with a concentration in foreign languages are required to take an additional six sequential credits of the same language at the Intermediate 1 and 2 levels (2010 and 2020) or Advanced 1 and 2 levels (2210 and 2220) as well as complete three credits in a second foreign language at the elementary level or above. See the following pages for concentration requirements. Fine Arts Select two sequential foreign language courses AND at least one course from: Art, Music, Drama.